Are you curious about psychedelics? Discover how to potentiate tremendous spiritual transformation, transcend your inner-demons, and deal with "bad trips". Are you curious about psychedelics? Discover how to potentiate tremendous spiritual transformation, transcend your inner-demons, and deal with “bad trips”. Richard L. Haight, bestselling author of The Unbound Soul provides a powerful, intimate, unbiased account of hallucinogens as they relate to the spiritual path. For his journeys, Haight makes use of three ancient shamanic plants found in South, Central, and North America, and he discovers a fresh perspective that catalyzes tremendous personal transformation. “I’m a purist,” my teacher said. “I don’t believe that psychedelics are necessary or even useful on the path of awakening. I feel that it is up to me to awaken on my own.” He echoed my personally held belief exactly. We were discussing my upcoming trip to the Amazon, where I was considering partaking in an ayahuasca ceremony with an Achuar shaman. Although I’d had many visions throughout my life, without aid of psychedelics, and I was an avid meditator, actively dedicated to my path of awakening, I felt undeniably pulled to the ayahuasca experience. I had experienced such a pull many times in my life, and I have learned to trust it deeply; with each one that I followed, there was a great, if not always pleasant, lesson that invariably proved to be a milestone in my life. My purist ideology and the pull to take ayahuasca were diametrically opposed inner forces, so I took the matter to my mentor in hopes of gaining some clarity on the issue. As my mentor and I were of the same ideology, he said that he was ill-suited to advise me on the decision, but he assured me that he trusted whatever I chose. Somehow that helped me, for I was still at a somewhat insecure place in my awakening process. My mentor, sensing my insecurity, told me plainly, “Trust yourself, for in every interaction I have ever had with you, it was clear that you have powerful inner guidance.” Hearing that, I decided my course, and a few months later I was lying at the forest edge of an Achuar village in the midst of a harrowing vision. After that trip I spent the better part of a decade exploring what I had received from my Amazon experience before I felt the draw to explore psychedelics further. By that time I was an instructor of meditation, autonomic therapy, and Japanese traditional martial arts, as well as a bestselling author on spirituality. My meditation students and I were discussing the ayahuasca experience when a student asked my opinion about psilocybin mushrooms and whether I thought they could be used as a tool for awakening. As I’d only had one psychedelic experience up to that point in my life, and as mushrooms are distinct from ayahuasca, I had no opinion to offer. I have had numerous visions throughout my life, and as a result of them I have discovered many powerful tools of awakening: unconditioned meditation, autonomic releasing, and specialized internal martial arts training. Surely there were many other effective tools, I thought. Could psilocybin mushrooms prove themselves to be another spoke on the wheel of awakening leading to the hub—Oneness? Psychedelics are both hyped and denigrated by differing factions within the awakening community. The more traditionally inclined tend to look negatively upon the use of psychedelics, whereas the more open-minded individuals tend to hail psychedelics. The chasm between these two groups is quite vast. I was caught between these two worlds by my “purist” ideology and the opposing pull to explore these substances. Heading into this experiment, I hoped that my experiences could somehow begin to bridge the gap between these two groups. My policy is to follow the pull wherever it leads me, come what may. To do otherwise would mar integrity and halt my awakening process. My subsequent experiment with psychedelics involved 12 trips over a two-year period. In this work I intend to walk you through my approach to psychedelics and to detail my key journeys and what I learned from them. I will also share with you the most current scientific information available on these substances and their potential medical uses, legal statuses, safety profiles, and methods for usage. Although I thoroughly researched the available literature on these substances before taking them myself, I ultimately followed my inner guidance regarding method, which resulted in an approach that is somewhat distinct from what is typically recommended. I share it with you in case you, too, might find it useful. This book is not intended to advocate the use of hallucinogens. Instead, it is meant solely as a means of sharing my experiences (the pleasant and the unpleasant), what I learned from them, and how those experiences aided me on my path of awakening. In the Appendix I include scientific studies and other need-to-know information on the substances that I used. Before I go further, I need to state that the decision to write this book did not come without much consideration. Although my inner feeling strongly indicated that this book needed to be written, I was concerned—no, highly concerned that the information presented here could inspire some reckless individuals, who neglect common safety protocols, to harm themselves. While the plants that I discuss in this work all have extremely safe profiles, they need to be respected and treated with care, for not every form of death is physical. After much consideration I realized that people who read and study before taking psychedelics are also likely to be more respectful of psychedelics, and therefore more likely to explore them safely. Please prove me right. My hope is that this work be of some aid to you in your life and on your path of awakening, regardless of whether you incorporate psychedelics into your path. It is not my intent to persuade the reader one way or the other, regarding psychedelics, but instead, to offer a fresh perspective that will help you to have penetrating clarity in all that you do. Many readers are doubtlessly more experienced with psychedelics than I am, so I am not writing this work as an expert on hallucinogens. Honestly, human beings know so little about these substances that it might be arrogant for anyone to claim expertise on this topic. Instead, what I am offering is an approach to life that also applies extremely well to psychedelic journeys. Surely there are many readers who have yet to try psychedelics but who feel drawn to do so at some point along their paths. It is my hope that the approach, information, and resources provided here will help those individuals to have greater understanding of and respect for psychedelics before jumping in. To those individuals who are convinced that psychedelics have no place on the path of awakening, I know exactly how you feel, for I too held that view for the majority of my own process. Even if you find yourself opposed to the use of psychedelics, it is my hope that you find my approach to life useful and stimulating. In my case, were it not for an unexpected, deep inner pull that led me to the Amazon, I might never have questioned my ideology. Even with the strong inner knowing that I should take ayahuasca, I did not enter the world of psychedelics lightly, and, in my opinion, neither should anyone else. Whatever the individual chooses on the path of awakening is ultimately the responsibility of the individual—or at least it is wise to behave as if that were the case. In this work I often describe a “pulling feeling.” The pull is a powerful sign of inner guidance that should not be confused with a common compulsion or urge. It is of a different nature entirely. The more that one follows this pull, when it arises, the more powerful its guidance becomes in your life. In a way, following the pull requires a leap of faith, for often it will lead you to face your fears and do things that you have been avoiding, despite knowing deep down that those things are right. Sometimes, as is often the case with me, the pull may force you to directly confront your ideologies and beliefs. Eventually it can become so powerful that your body will begin to move entirely on its own through complex activities, so long as you allow it. In my estimation, the single most powerful thing that people could do on their paths of awakening is to awaken to the pull, for that is your guidance system on your path. From this place of inner guidance I entered my psychedelic journeys. If the reader has never experienced such a pull, this book might be easily misunderstood. As there is no way to give the pulling experience to the reader, I must accept that limitation and work around it as best as possible. Just know that the rational mind is but one of the most recently developed areas of the brain. Many other powerful structures in the brain can also serve to guide our lives. I merely ask that you suspend your disbelief while reading, so that you may receive as purely as possible. Here’s to your path of awakening, whatever it may entail! In late June of 2009, I joined an ecotour group in Ecuador. We spent several days traveling around the country by bus, going from the capital city of Quito to the cloud forest of the Andes, then into the lowland jungles to the headwaters of the Amazon River. We flew into the jungle via a prop-driven Cessna plane, piloted by an Achuar tribesman. Once we landed, we canoed to a small village that had been constructed by the Achuar specifically for ecotourism. We spent a few days at this camp, where we lived in Achuar-made, palm leaf-covered huts, and we hiked through the surrounding jungle to learn about the local flora and fauna. After a few days we were invited by a shaman in a nearby village to take part in a traditional natem ceremony. Natem is the local word for a powerful psychedelic commonly known as ayahuasca, “the vine of the soul.” We were given detailed information on what to expect once we arrived at the village, what the ceremony would entail, and how to safely navigate the ayahuasca experience. We were all eager to begin our three-hour hike to that village the next day. Those of us who were intending to receive the ayahuasca began fasting. We left the next afternoon for a silent, prayerful hike to the shaman’s village, led by our Achuar guide. I think I was still a bit nervous at the idea of taking ayahuasca. I didn’t have a very positive view of mind-altering substances because, as a young man, I had used marijuana and alcohol to escape. A lot of resultant suffering followed my misguided use of those substances. Although we had been told that ayahuasca would not alter our sense of self, I was still somewhat suspicious, even as I felt strongly drawn to take it. A few hours into our trek, we came across some fresh jaguar tracks. The Achuar guide indicated that the cat had passed only minutes earlier, and that our presence had probably scared it off. The tracks, each of them larger than my palm, were clearly visible on the trail. We were in the thick of it, for sure! Unexpectedly, the inspiration I felt from seeing those paw prints put me at ease about the upcoming ceremony. As we neared the village, we took time to spread out and find solo sit-spots where we could privately construct a list of questions to be answered through the ceremony. After assembling my list, I had a strong feeling that the ayahuasca vision would provide guidance for my life’s mission. We remained in our sit-spots for 30 minutes before we continued our trek. Within a few minutes we came to a deep, flowing creek with a large fallen tree bridging its banks. A loinclothed Achuar villager looked on in amusement as our guide led us across the creek. We continued through a small valley and up a hill to a clearing atop it that overlooked a vast Amazon tributary. There at the flat center of the hill were two large community huts. We had arrived. It was already well into afternoon at the time, so we set up our tents near the manioc gardens, a bit away from the main tribal huts. After setting up our tents, we gathered to discuss the upcoming ceremony and to decide who was going to take the natem and who was planning to help. The helpers assist journeyers in getting to a secure place in the forest for some privacy and safety, and they lead the journeyer back safely once the visionary experience is complete. We waited in silence near the edge of a high cliff for the sun to set over the vast tributary that flowed below us. The ceremony was soon to begin. About a half hour later, when it was dark enough, we were led to the shaman’s hut and asked to sit on benches around the pillared, open-air rim of the space. The shaman was an elderly gentleman in traditional attire with an orange, parrot-feathered headband. He was clearly in deep prayer as he stirred the cauldron of neon-orange natem. He whispered in a songlike rhythm as he blew tobacco smoke into the brew, which had been simmering for most of the day. He stirred the natem with clear affection, and then he turned and greeted us. The ceremony began as he directed me to sit on a stool in front of him. He blessed me with a feather and then gazed at me before he filled a large, decorated clay bowl to the brim with natem. Through a translator, I was told to drink all the liquid quickly. After downing the bitter stuff, I was given some water to wash out my mouth. Although we were told that the effects of natem would probably start about an hour after consumption, I was feeling something strange within 15 minutes. My entire vascular system began to vibrate, and my blood felt electric. Because we were told that ayahuasca comes on slowly, I thought I might be imagining the strange feelings. Within a minute, dizziness overtook me, and I told my helper, Larry. “You’re imagining things,” Larry said. “Fifteen minutes is way too quick for effects to begin.” I told him that I was about to puke, and without delay, he guided me away from the hut to the edge of the forest. My eyes must have been dilated, because the light from the shaman’s hut was overwhelming. I lost all sense of direction and was unable to stand on my own. It was the most disorienting experience of my life. Larry kindly took my arm over his shoulder and guided me safely to our destination. Once there, I got on my hands and knees to purge before I rolled onto my back, thankful to the earth for holding me steady. A mosquito landed on my forehead and speared my third eye. I felt a pinch, and with that I closed my eyes—the journey had begun. I heard an undulating vibration like that of millions of cicada in chorus. As the sound intensified, I could feel an energetic pressure rising from the base of my body up to the top of my head, threatening to blow like a volcano. By the time the energy reached the crown of my skull, it was a screaming, high-pitched, frenzy of intensity that finally exploded from the top of my head. I found myself sitting, eyes open, on the jungle floor during the day. A small, light-blue butterfly fluttered just before me. It had a dot on each wing that looked like eyes. The butterfly fluttered off just as the image of a boldly colored fluorescent lizard flashed before me. Then I found my perspective no longer in the forest but instead in the heart of the earth. A frighteningly powerful voice addressed me. My lesson had begun. The voice started by teaching me the purpose of life on Earth. I was shown rapidly approaching societal destruction and the renewal to follow. I was taught of the coming of Christ and the resulting shift that would cascade throughout humanity. I was shown that humanity is on the verge of an incredible enlightenment that would come with the mass exposure of corruption rampant at all levels of society. I saw that the three pillars of humanity—economy, ecology, and society—will soon fail. I was shown that consciousness from the center of the galaxy will be bathing the solar system with ever-increasing intensity. And with this intensity, the corruption, greed, and selfishness that run through society will cause civilization to implode, destroying everything around it. I was shown that the attitude people take toward the changes in society will determine one of two possible futures. If people selfishly resist positive change, the human population, as well as most of the flora and fauna of the planet, will be reduced to near-extinction levels. Suddenly, I found myself immersed in the unbearable suffering of humanity. Although there were no images, what I felt is well beyond my capacity to describe. Then I was removed from that hell and shown the second possibility. If humans choose to embrace the changes with a positive attitude, determined to learn and to live in a way that loves and honors all of life, then things won’t be quite as difficult. I was dipped into the hellish suffering represented by this possible future. Even in this lesser hell, the mass suffering was beyond my comprehension. Due to the momentum of our societal structures, I was shown that mass suffering was unavoidable. The only question remaining was the degree of suffering that we would experience on this planet. I so wanted to know whether there was some other path that didn’t result in hell, but ayahuasca denied me. After the collapse, I saw that the remaining population would transition into a truly inspiring, enlightened way of life. People will live positive, inspired lives in communion with all things. I was shown that, after the collapse, what we now call miracles will be considered perfectly normal and natural. I saw how truly important attitude is to the awakening process. It is wise to treat our experience on Earth as we might a school and a teacher. Use the experiences that life offers as opportunities to exercise a positive, loving attitude. The experiences will not always be pleasant, and many will be hard. But consider any good sports coach. Does that coach baby us in hopes that we will gain skill and ability? Not at all. The coach challenges us to our limits, and sometimes even beyond, knowing that through hard training we will gain ability and strength. How well we do is dependent upon how coachable we are. Consider that the Earth experience is training, but instead of adding through this training, we are stripping away all that is blocking us from our deepest, innermost harmony. I saw an image of the planet wrapped by a serpent that was eating its own tail—the ouroboros. I saw in this symbol the idea that experience is earned by the individual, and that there are no accidents. The head of the snake, representing the present moment, is consuming its own tail, the past. I was shown that we have created the world we live in through past incarnations, just as we are now creating the world we will be born into in future incarnations. We get experiences that will challenge us. The attitude that we take toward those experiences is totally up to us. Eventually, when the shallow life that prioritizes pleasure, power, safety, comfort, approval, and distraction fails to satisfy, we will wake up to the training opportunity. Upon taking up the training, we will find the opportunity to realize our fundamental nature, which is harmonious. I was shown that there are many more people on the planet now who are ready to graduate the school of the Earth than there have ever have been at any time in the history of this planet. First, one person will graduate and light the way for a great enlightenment on Earth. I was shown that, for roughly the next thousand years, this planet will remain at a high state of harmony and provide a wonderful opportunity to graduate for many individuals. Imagine living in a world where everyone lives positive, inspired lives and seeks understanding, a world where awakening is possible for all. What a beautiful world it would be. I saw that attitude is the key to awakening, and that an awakened individual has mastered right attitude. We must not seek a savior. Each individual needs to take responsibility for their own path, with integrity, ever opening to the deepest place of being within. You may have many teachers and guides during your life, but learn from them wisely, without relying on them or trusting them blindly. Do not worship them, for no one is any more or less spiritual than you are. With right attitude, one learns constantly from others while questioning and testing everything within one’s own life. Most importantly, we will begin to learn from our innermost being, through the process of awakening; we will no longer treat the people, the flora, and the fauna of the world merely as resources to be exploited, for we will see the intrinsic value and beauty that is inherent to everything. That doesn’t mean we will no longer participate in the harvest. Instead, we will see that harvesting with right attitude is vitally important to maintaining a healthy ecosystem. I was given instructions to prepare for my mission on Earth. By combining the martial, meditation, and healing arts that I was studying in Japan, I would discover a principle that would then transform those arts into a path of enlightenment that would, in turn, aid many to graduate the school of the earth. After the vision was over, Larry led me back to the shaman’s hut. I was directed to the shaman’s table, where I was energetically cleansed with a feather and the shaman’s breath. I spent the next few hours lying on the ground, stargazing until my body had normalized enough to walk, and then I returned to my tent and slept for the rest of the night. I woke up the next morning feeling physically healthy aside from the miserable pain of hemorrhoids that had blown up to the size of a golf ball from the internal pressure generated by the experiences of Hell. Psychologically, I was in a state of shock, for I could not forget what I was shown of the horrors to come. I wanted to discount the vision, but the more I thought about it, the more I was convinced that our society was sprinting off a cliff. I knew that nations worldwide were suffering social decay, and that the financial system was already careening. After all, it was 2009, just a year after the global financial system almost collapsed. Thanks to corruption in banking and in government, I didn’t believe that the banking system was being honestly reformed. And regarding the environment, I could clearly see decline in my own lifetime. Rationally speaking, I could see that all three pillars of civilization were in rapid decline. To me, there simply was no logical escape route for humanity, and that was a depressing realization. Although we returned to our village later that morning by canoe, I do not remember much of the trip, so immersed within myself was I. I was trying to get a grip on the enormity of what I was shown, but my psychological grasp was just too small for the task. In retrospect, I am sure I was suffering from post-traumatic stress disorder. My own mission regarding the coming changes was too much to digest, so for the rest of the trip, I was pulled into myself and out of touch. Before the vision I was a highly engaged, positive, leading element in our group, but after the vision, it was as if a switch were flipped. I was quiet and disengaged. Many group members kindly showed concern and tried to get me to speak of my vision, but I felt that sharing the vision was inappropriate, so I remained bottled up for the remainder of the trip. Several years passed before I had digested enough of the vision to share details with anyone other than my wife and my martial arts instructor. My instructor found the idea of combining the healing, meditation, and martial arts intriguing, so we began training privately for many hours every day—he taught me martial arts, and I taught him meditation and Sotai-ho, a healing art that I was licensed to teach. As I was living in Japan for the purpose of training, I used the next few years to explore the power of attitude within my training. I was interested in how the unconditioned power of appreciation and love could be applied to the therapy, meditation, and martial arts that I was studying. I was searching for a way of being that expedited the path of awakening, while simultaneously advancing my studies in the arts. My martial arts instructor fully supported my search, and by means of inner correction, we progressed rapidly in the arts. After a few years, I received master’s licenses in four samurai arts to go along with my license in Sotai-ho. I returned to America to fulfill my responsibilities. 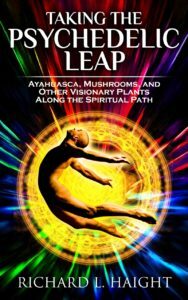 Taking The Psychedelic Leap has 23 reviews with a 4.8 average rating. Thank you for reading From the Soul. It is my deepest prayer that you enjoyed the story and that some of the insights held within these pages prove valuable to you on your personal path of awakening. For countless eons human beings have initiated the transference of knowledge through story, and learning through stories is in the very nature of human beings. It is in the spirit of honoring human nature that I include my personal story of awakening in hopes that it will expedite your own awakening process. Stories, when properly applied, give context to teachings, and without context all teachings, all principles may lead astray or be forgotten entirely. It is essential, however, that the learning not end with the story. We need to embrace the teachings and principles through practice in daily life to awaken the seed of consciousness within. Once we begin applying these principles to our lives the awakening process gains momentum and ultimately reveals the harmonious power within that transforms your life. It is my sincerest hope that you are inspired to take the next step by reading further to discover the principles, teachings, and methods, so that you may begin applying them to your life. In this way you will discover the pearl beyond price that lies hidden within you! Here is a list of psychedelic literature, works related to psychedelic drugs and the psychedelic experience.